The author of 'The House of the Spirits' returns with a gritty yet transcendent tale of teenage addiction. The narrator and protagonist of MAYA'S NOTEBOOK is a 19 year old girl who grows up in Berkeley, California, and falls into a life of drug addiction and crime. To rescue Maya, and save her from the criminal types pursuing her, Maya's Chilean grandmother sends her to a remote island off the southern coast of Chile. Here she lives among a traditional rural people, the Chilote, who speak an older form of Spanish and have remained largely isolated from the materialism, crime, and fast-paced contemporary life which is our own. The book alternates between the narrative in the US and that on Chiloe, the island, so the two strands of the story unfold for the reader at more or less the same time. 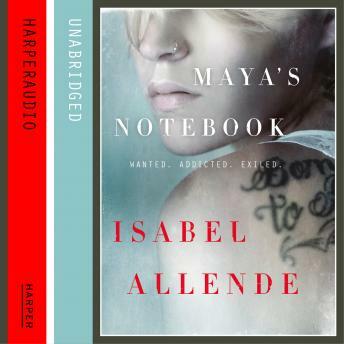 This new book is very different from Isabel's previous historical novels: a contemporary setting; an American (of Latino descent) teenage drug addict as the protagonist and narrating voice; a realistic style of writing rather than a magical realistic one (Chiloe exists, and one can visit it). Maya's voice is modeled on that of Isabel's teenage granddaughter, a native of the Bay area (San Francisco, Berkeley).